Hey now, you get your mind out of the gutter! American Dippers are birds that are well-known for their unique underwater foraging technique. 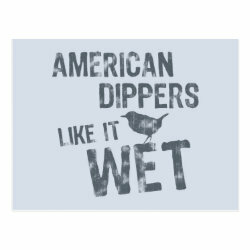 This original More... design for birders and bird lovers reads "American Dippers Like It Wet" in a grunge-style font. A silhouette of an American Dipper (also sometimes called a Water Ouzel) perches on the text. The design is distressed overall for a stylish, vintage look.